Gift Guide #2: Thanksgiving has passed and we are onto Black Friday and all the discounts, but Christmas is only a month away. In the PEZ Holiday Gift Guide #2 we have a mixed bunch of suggestions: Top clothing from Assos and Danny Shane, bottle cage deal from Silca, bikes from Basso and Priority with winter tire package, bike wall mount from AIRLOK, winter shoe from Bontrager and the milKit compact kit and valve system for your tubeless. You can see the 'PEZ Holiday Gift Guide'18 #1' HERE. For the ultimate protection in frigid conditions, the ULTRAZ Winter provides meticulously engineered insulation and climate control. At the heart of this protective 3-layer soft-shell jacket is the high performance hydrophilic membrane and thermal twinDeck fabric on the front for added waterproofness and more protection. On the upper back, a place that is vulnerable to bad weather when on the drops, there is strategically placed NEOS LIGHT, ASSOS’ lightest water-repellent trilateral soft-shell material. Not only a great barrier to freezing conditions, the ULTRAZ Winter is impressively breathable and wicks moisture fast. Topping off this winter jacket, it features an integrated neck protector, a new cuff design to retain heat and minimize bulk, and ASSOS’ ergonomic waistWave construction. The full Assos collection HERE. Elongated mounting eyelets, premium ti mounting bolts, excellent bottle retention, and industry-leading warranties. There's a lot of love about our SICURO line of titanium and carbon fiber bottle cages and today there's even more. 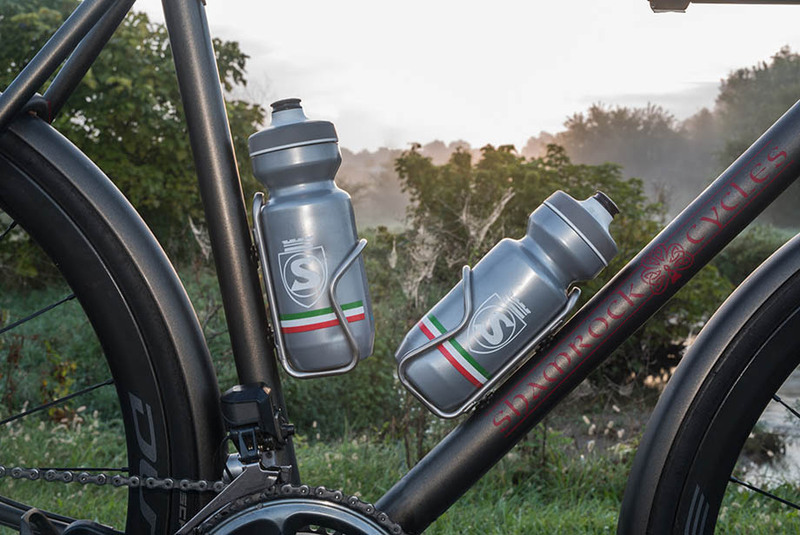 Purchase a bottle cage today and you'll receive one of our SILCA branded 22Oz Purist water bottles with each cage. Get the free bottle offer HERE. This low maintenance commuter that stands out during the day and at night, ideal for being seen on shorter days of fall and winter. The Onyx provides added safety with its 360-degree visibility package that features reflective sidewalls on the tires and reflective frame decals, as well as a Dynamo headlight and tail light that is powered by the front hub as you ride. The new version of the Continuum Onyx has been updated with latest enviolo smooth riding and continuous geared hub with more gear range (now 380%), a light that will power your phone, and a more comfortable and lighter carbon fiber seat post that helps with vibration dampening. 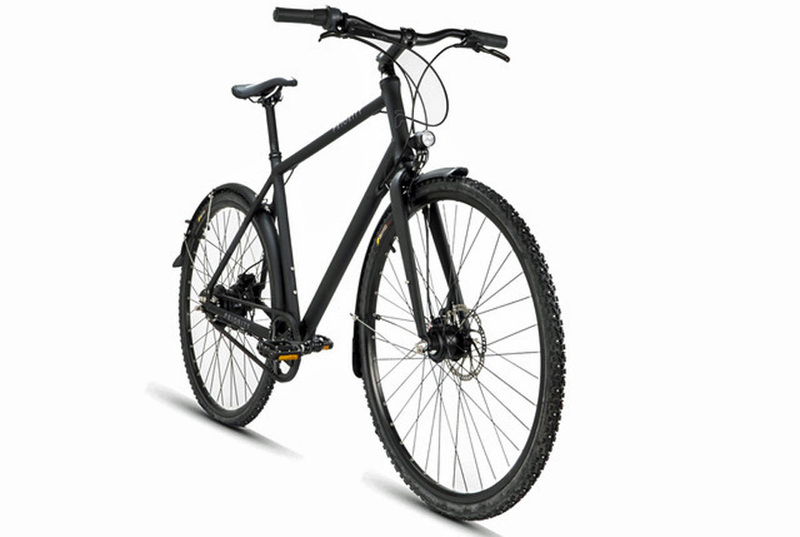 It also features a Gates Carbon Drive belt, hydraulic disc brakes, and if you ride in snow and ice, add on the studded tire package for ultimate performance in winter conditions. Gift ‘em this! AIRLOK, launched just last year, Hiplok’s high security wall mounted bike hanger is now customizable. The high security lockable bike hanger allows cyclists the opportunity to completely personalize their AIRLOK, by color-coordinating the lock with their bike frames or home interior through an infinite choice of colors and bespoke finishes. From carbon to concrete, “Rapha pink” to “real rust”, AIRLOK CUSTOM will appeal to cyclists that put a premium on both security and aesthetics in their bicycle storage. As Jack Frost weather creeps in and toes start to freeze reach for the JFW Winter Shoe to extend your riding. This cold weather shoe was designed specifically for dedicated rides who want to stay warm and dry without having to worry about bothersome shoe covers as temperatures range from 40F/4.4 to 25F/-3.9C. 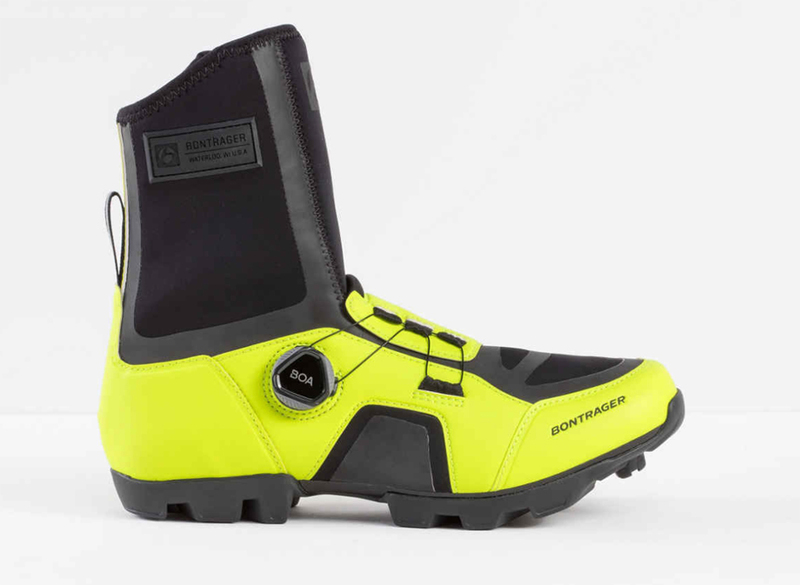 It features the Boa Fit System for a precise fit and easy adjustment on the fly, a neoprene water-resistant upper that completely covers the ankle to keep feet warm and dry, and highly visible colors and reflective elements to be seen when it matters most. 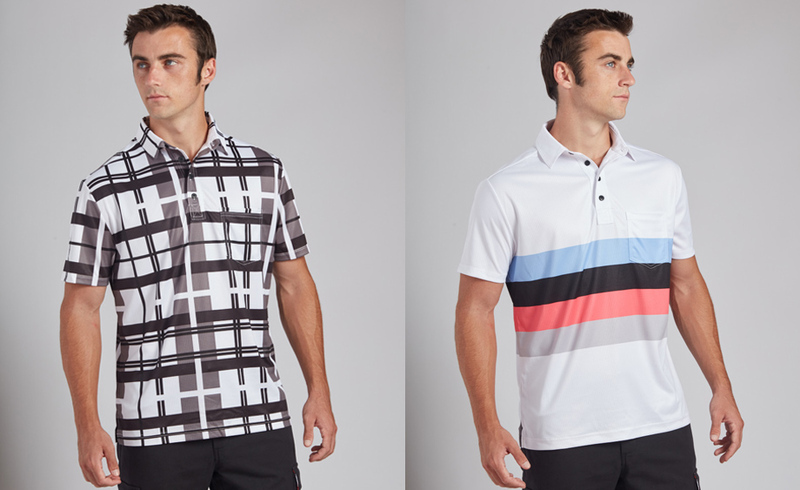 Capitalizing on the advantages of our Bamboo White Ash fabric and DS's signature "Modern Classic" designs, these polos were designed with the outdoor recreation-enthusiast in mind. They're stylishly tailored, but the cut is looser and longer than their cycling counterparts, allowing for more variety of use: Look your best on your mountain or commuter bike, at work, on the golf course, or at the coffee shop or café. Some also feature a rear zipper pocket for added versatility on the bike or off. The milKit Compact Kit and valve system has revolutionized the way we maintain tubeless. With the one-way rubber valve when the valve core is removed, easily inflate the tire with maximum air flowing into the tire, without the possibility of air releasing back through the valve. The syringe system in the Compact Kit allows you to effortlessly check and replace sealant without having to remove the tire and keeps you clean while doing so. This kit is easy, reliable, clean and exactly what tubeless needed! Storage? Check. Uber soft stretch cotton? Absolutely. Ideal for commuting, travel, work and urban nightlife? Damn right! 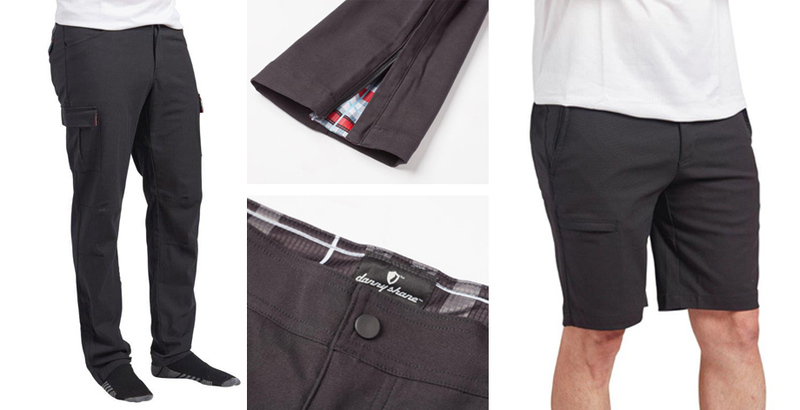 It's the details that make this such a great all-around product: bamboo liner in all pockets and waistband add softness and sweat absorption; custom ankle zip keeps the legs out of your chain and offer a straight-leg profile (or wide if you prefer) after the ride; and the overall style shows you care about how you look. (also available in shorts; $39). 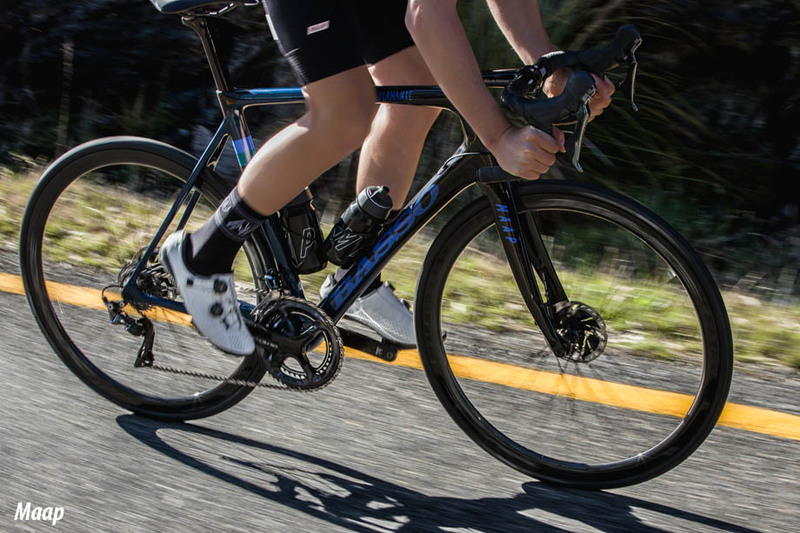 Basso Bikes is excited to announce the MAAP - Basso Diamante 2019. This is the third year of the collaboration between Basso Bikes and MAAP. 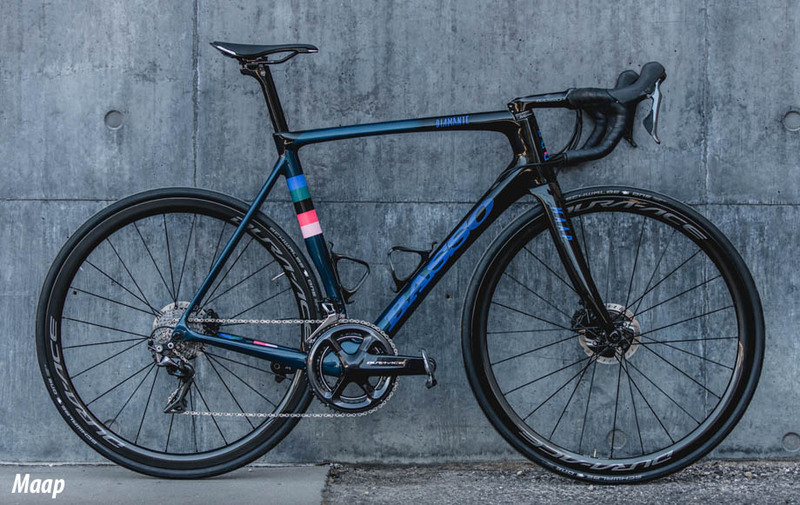 The fade that goes from black to dark blue and the five stripes on the seat tube reprise the jersey of the team that will race the 2019 season with this bike. The Maap-Basso Diamante will be available to the public both in disc or rim brakes.